Résumé Roundup, hosted by Rockwell Career Center, gave UH Bauer students the chance to fine-tune their résumés before the Feb. 15 Business Career Fair. Business students looking to start their career path should look no further than the Spring 2011 Business Career Fair on Feb. 15 hosted by Rockwell Career Center. Nearly 100 companies will fill the Houston Room in the University Center, looking for students to fill job and internship positions. The bi-annual career fair has become a “can’t miss” event for both employers and students. The biggest companies in Houston, from CenterPoint Energy and ExxonMobil to Amegy Bank, will be in attendance to recruit students and offer networking opportunities. And as much as students are out looking for opportunities, recruiters are also looking for students to join their respective companies. Houchins also stays connected to the college and its students by volunteering at the Rockwell event preceding Career Fair, the Résumé Roundup (held in the past as Résumé ER) held this semester on Feb. 10-11. Many recruiters like Houchins volunteer their time and energy to help UH students gain an edge on the competition and make themselves more marketable to employers. UH Bauer students say they benefit from having regular interaction with recruiters through Rockwell events, giving them the opportunity to prepare for the job market. And even if students are not looking for career opportunities at the moment, at the very least, events like the Résumé Roundup and the Career Fair offers students a chance to simply chat with business professionals and to learn more about careers they might be interested in. 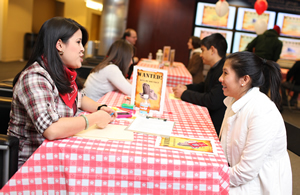 The Spring 2011 Business Career Fair will be held on Feb. 15 from 1:30 p.m. to 5:30 p.m. at the University Center in the Houston Room. The event targets business students, and professional dress is required.